LOS ANGELES – The next generation Saab 9-3 sedan may have a different name when it debuts in the first quarter of 2013, the automaker's North American president said. "There's a chance we might move away from that," said Tim Colbeck, president of Saab Cars North America. Instead, the company may adopt a name for the 9-3's successor that draws from the brand's heritage, although no decisions about the name have been made, he said. Colbeck said the next-generation 9-3 is scheduled to go on sale in the first quarter of 2013 and will be an "edgy" reinterpretation of design cues used by the automaker in the past. He declined to be more specific. A successor to the Saab 9-2 produced in the late 1940s through the mid-1950s is also back on the drawing board after the Swedish automaker was able to secure a new round of funding from investors. "It wasn't in the business plan prior to the new investment, and now it is," Colbeck said Tuesday, adding that CEO Victor Muller and Jason Castriota, Saab's executive design director, are reviewing about five designs for a modern re-imagination of the 9-2. 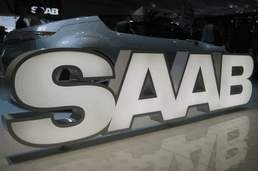 In the meantime, Saab plans to complete the 2012 model year changeover for its current vehicles in the fourth quarter. The 2012 Saab 9-4X crossover, currently on sale as a 2011 model, will debut in October. Model-year 2012 versions of the Saab 9-5 sedan, 9-5 Sport Combi wagon and 9-3 are all also scheduled to debut in the fourth quarter, also likely in October, Colbeck said. Colbeck said Saab is on track to resume production at its vehicle assembly plant in Trollhattan, Sweden, on August 29. Saab has been forced to suspend output because suppliers have withheld shipments pending payments since the spring. In addition, Saab paid its white-collar workers in Sweden in full last week, a Saab Cars North America spokeswoman said at an event here.